Saturday, October 19th from 5-8pm. This annual family-friendly event will take place on Saturday, October 19th, 2013 from 5-8 PM in Market Square. 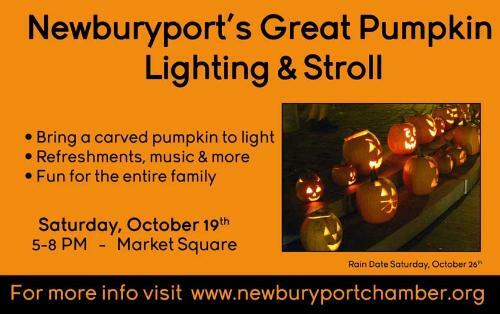 Families are encouraged and invited to bring a carved pumpkin that will be lit and placed on the stage in Market Square for all to enjoy! Each family will receive a votive candle that will be lit all at once at dusk. After the lighting, attendees are encouraged to stroll the downtown and Tannery to "ooh and ahh" at all the pumpkins designed by local businesses! At the end of the evening families are asked to take their pumpkins home for safe keeping. This event is brought to you by the Greater Newburyport Chamber of Commerce and our retail members!